A Tale of Two Southwarks is an exhibition of oil paintings, photographs and mixed media works by Suchi Chidambaram and John Pheasant. Southwark’s ‘two cities’ - its glittering redevelopments with their thriving business sector on the one hand and the pockets of poverty and deprivation on the other - are well documented_. The inspiration for the exhibition is the incisive report, ‘A Tale of Two Southwarks, A needs analysis of the London Borough of Southwark, to which Roast’s Founder, Iqbal Wahhab, referred Suchi early in 2017. 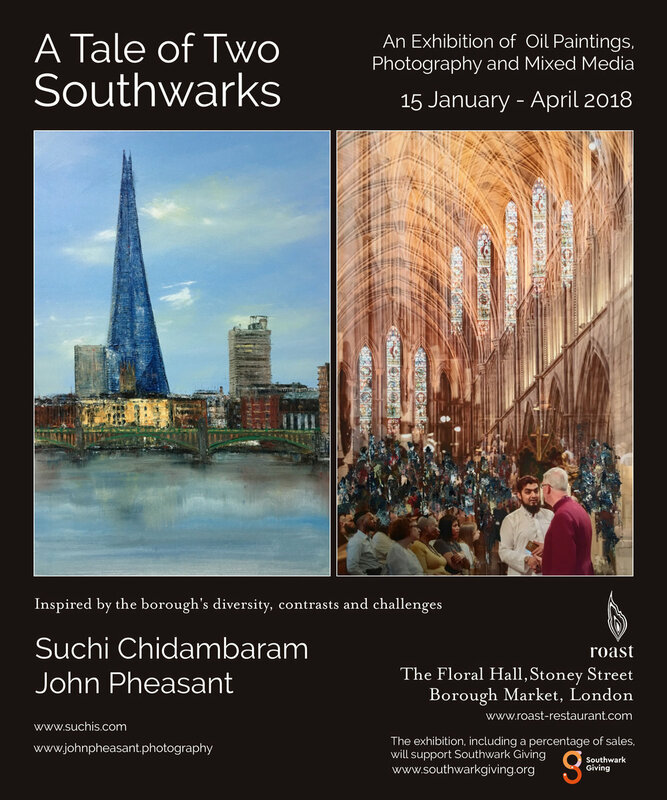 Inspired by the borough’s diversity, contrasts and challenges, Suchi, an oil painter, and John, a photographer, set out to capture the two Southwark's visually for an exhibition specifically designed for the space in Roast in Borough Market. Their ambition is to encourage visitors to Roast to reflect on the borough’s diversity and contrasts, to engage with its challenges and, hopefully, to be part of the solution and to offer support to Southwark Giving.